Faculty who were recognized at the inaugural breakfast included Joseph Turner, Laurence Rilett, Bing Chen, Hamid Sharif-Kashani and Carl Nelson. 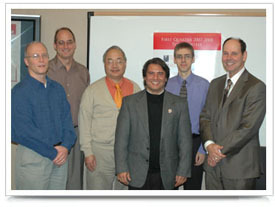 They are pictured with Dean David Allen. Bing Chen, computer and electronics engineering - "Silicon Prairie Initiative on Robotics in IT (Phase II)," National Science Foundation. Yuris Dzenis, Joseph Turner and Ruquiang Feng, engineering mechanics - "NIRT: Nanomanufacturing and Analysis of Active Hierarchical Nanofilamentary Nanostructures," National Science Foundation. Shane Farritor, mechanical engineering; Carl Nelson, mechanical engineering; Hamid Sharif-Kashani, computer and electronics engineering; and Joseph Turner, engineering mechanics - "Track Stability Assessment and Data Transmission," U.S. Department of Transporation. Laurence Rilett, civil engineering - "Region 7 University Transportation Center," U.S. Department of Transportation. William Velander and Kevin Van Cott, chemical and biomolecular engineering - "cGMP Recombinant FIX and Oral Hemphilia B Therapy," Department of Health and Human Services National Heart Lung and Blood Institute. Brent Wilson, mechanical engineering, and Joseph Turner, engineering mechanics - "Development of Improved Product Performance Through Optimization and Modeling of Engineering Materials, Processing, and Function," Brenco/Amsted Industries.